Your professional development will rely on our university’s excellence in terms of its academic level, its highly qualified teaching staff, the research that it develops, and its international vision as well as access to the best human, technological, academic resources and infrastructure. You will have the possibility to autonomously and creatively plan and develop your degree in line with your interests due to the flexible curriculum at the university. You can study electives, you can do a double degree, participate in exchange programs and work-placements, take an option from another academic area, study Master’s degree subjects, change your degree program, as well as many other options. All this is subject to good academic achievement and no additional costs. It allows you to develop your autonomy and consolidate the understanding of your responsibilities with your country and surroundings. You will study at a university that promotes diversity, the ability to understand different points of view, and the respect for ideas. It has an environment that is dedicated to academic life and hosts cultural, sporting, and wellbeing activities as well as student clubs and societies. 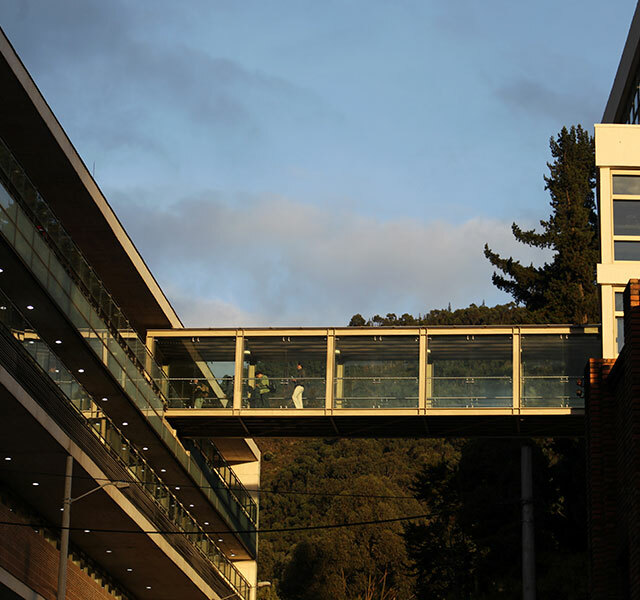 The Universidad de los Andes makes agreements, alliances, and networks with national and international educational institutions to obtain opportunities for academic, cultural, and scientific exchange. This contributes to the comprehensive education of our students, the academic strengthening of our teaching staff, the development of research, and to the university’s positioning within an international context. Every year the Universidad de los Andes holds the International Summer School, which includes highly prestigious lecturers with international experience from important universities. This gives students the opportunity to exchange projects, ideas, and experiences within an external development framework and allows them to have access to a wide supply of courses from different faculties. Also, students can attend different seminars, forums, and lectures as well as take part in research projects in different areas. These are organized within a rigorous academic environment that is cutting-edge and has a high international quality in which the student shares and exchanges experiences, creating contacts and professional networks. As a student at the Universidad de los Andes, you are allowed to use one of the most modern library systems in Latin America. The system is made up of five specialist libraries in the fields of Business, Architecture and Design, Law, Economics, and Medicine, and the “Ramón de Zubiría” General University Library. The physical spaces and information resources are not only adapted to the needs of the university but also the country’s demands. The system’s ability to develop and its synergy with the use of technologies and the integration of new elements that are adjusted to national and international standards facilitate remote access to its collections and services. This means it is a versatile, intelligent, and flexible system that makes the users autonomous by providing the right, quality material from its bibliographic resources and national and international inter-library agreements. The purpose of the library system is to act as a pillar for the university’s academic, research, and further education projects by supporting them with information resources, adequate spaces for group and individual study, electronic resources references, projection of audiovisual material, rest areas, and help from a professional team that is responsible for guidance and help in order to develop the skills needed to be able to manage our information resources. All our services can be found on our webpage: http://biblioteca.uniandes.edu.co. Students can consult 116 online databases, access our public catalogue that has more than 502,000 books (in print and electronic format), audiovisual material, theses, as well as a comprehensive collection of journals with more than 87,000 titles available. In line with Decree 1067 of May 26th 2015 and Resolution 714 of June 12th 2015, both issued by the Ministry of Foreign Relations, it is mandatory that foreign students who are going to study in Colombia either have a student visa, another type of visa that includes studying, or a special type of visa that allows them to study. It is advisable that masters and doctorate students make enquiries in their faculties/ departments/ academic units as soon as possible about the “Work Visa” in case they have the opportunity to become a Graduate Assistant. Additionally, current Colombian law requires foreign nationals, including minors, who hold a visa that is longer than three months, to carry their foreign ID cards on their person. This should be taken into consideration and the ID card can be organized together with your visa. If, however, it is still being processed, then a copy provisional ID document can be shown if requested. Through this program, ICETEX offers scholarships for Master’s, Postgraduate Diploma, and postgraduate research students who are foreign nationals coming from countries that have a reciprocal agreement offering scholarships to Colombian students.